There are a lot of problems that can befall a horse when out on the field, and perhaps the most troublesome of these is insect bites and irritation by flies. It may seem like a minor issue, but it can lead to many health problems for a horse including Sweet Itch and other ailments. Luckily, there is something you can do. 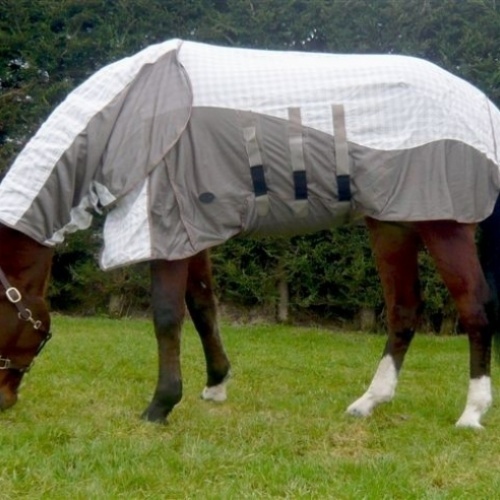 By investing in one of the many Mark Todd Summer Combo Rugs, you can feel confident that your horse is well protected against the threat of insect and midge bites, as well as a whole host of other things that can affect a horse?s wellbeing. The weather, for example, as well as dirt and debris that can be kicked up and muddy the horse?s coat. All of the Mark Todd Combo Rugs have been designed and developed with Olympian horse rider Mark Todd, and are of the utmost quality. Why choose Mark Todd Summer Combo Rugs? 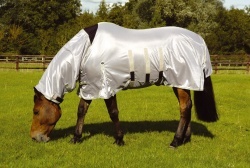 These Mark Todd Summer Combo Rugs are designed to protect almost every part of the horse that?s exposed to insect bites. That means that every one is well fitted to the horse, as well as being breathable so that the horse is comfortable. These Mark Todd Combo Rugs cover both the flanks and hind quarters of the horse, as well as the neck. The rugs feature double buckles, gusseted tail flaps, belly flaps, heat reflecting mesh, and much more. The Mark Todd Combo Rugs are totally adjustable, so you?ll always be confident that your horse is comfortable and happy whenever they?re wearing one of Mark Todd?s rugs. You shouldn?t need reminding about why it?s best to keep your horse happy, and the Mark Todd Summer Combo Rugs are a great step forward in ensuring their wellbeing. Many horse owners have discovered how miserable afflictions like Sweet Itch can cause to horses, so it?s easy to see why so many riders choose Mark Todd Fly/Air Mesh Combo Rugs to keep their horse protected and safe. Plus, these rugs offer protection against the elements too. In summer, when there are lots of flying insects like midges around, horses can find themselves irritable and in pain because of the constant buzzing pests, and the heat. But with Mark Todd Combo Rugs, the horse will be safe and happy, protected from the heat and able to enjoy the warm weather. Because Mark Todd is a world famous horse rider, you can trust that all of the Mark Todd Summer Combo Rugs are designed and developed with the rider in mind. Mark knows exactly what it takes to keep a horse happy and healthy, and he?s used this experience to create a range of rugs that are as practical as they are stylish. Don?t settle for second best when the Mark Todd Summer Combo Rugs are available at a great affordable price to make sure your horse enjoys its life ? and the summer months ? as much as you do.